Fortnite’s High Explosives mode fills large areas of the screen with bright, rapidly moving images that can trigger seizures. Maybe you’ve heard about the video game Fortnite that now has 45 million players? One reason it’s so popular is that it’s free to download — with its seizure-inducing graphics. Playing Fortnite involves quite a bit of shooting that creates bright flashes. The flashes are especially likely to trigger seizures when the game is played in “high explosives” mode (available during limited release dates). The high explosives create bigger explosions splayed across larger areas of the screen, which in turn affects a greater number of neurons in the brain’s visual processing system. For reasons not entirely understood, in people with photosensitive epilepsy, flashing light and certain other visual stimuli overload the visual cortex in a way that leads to seizures. In one user-uploaded, 7-minute, 39-second gameplay video using high explosives, 8 separate image sequences failed to meet the standards for minimizing the risk of visually triggered seizures. Each of those failures represents a visual sequence with a reasonable chance of setting off seizures in persons who have photosensitive epilepsy. The test for seizure risk from images is based on guidelines for reducing visually induced seizures, determined by extensive research on the image qualities that can bring on seizures in people with photosensitive epilepsy: motion, brightness, contrast, patterns, color intensity, and flash/flicker . Fortnite’s developer, Epic Games, has come out with remarkably frequent product updates to address performance bugs and keep players’ interest from flagging. (No issues with maintaining players’ interest level — maybe you’ve also heard about parents and teachers struggling to handle kids’ unprecedented preoccupation with this game?) Last week Epic removed a guided missile weapon from the game — for now — due to a bug and some player feedback that using the weapon disturbed the sense of fairness and balance of the game. That still leaves grenades, rocket launchers creating big flashes in high explosives mode. Problem flash isn’t limited to explosions. The flash in this sequence came from spacecraft lights. Perhaps the company’s unusually rapid product development cycle would make it possible to modify all the game’s graphics where the image sequences place users at risk of seizures? There are tools available to developers to identify the offending images — what I use to test the gameplay clips is just another version of the same Harding Flash and Pattern Analyzer software. You can read here about the way I do the testing. Maybe. Estimates are that up to 3 percent of the population has photosensitive epilepsy (among those with any other form of epilepsy, about 5 percent). Photosensitive seizures typically begin between ages 8 – 20, and they can occur in people with no history of epilepsy. Of the hundreds of children who had seizures during a 1997 Pokémon cartoon broadcast in Japan, researchers found that 74 percent of them had never been aware of experiencing a seizure before. The prevalence of photosensitive epilepsy is probably underestimated because seizures are not always noticeable, and therefore not always reported or even suspected. The symptoms of a mild seizure may be so subtle that nobody realizes what’s occurred. That doesn’t mean a mild seizure is nothing to worry about; any seizure has the potential to leave disabling physical and cognitive after-effects and mood changes that can last for days. Parents and teachers are struggling to handle kids’ unprecedented preoccupation with Fortnite. To learn about the effects of video games on the central nervous system, and about finding ways to reduce your child’s screen time, I recommend Dr. Victoria Dunkley’s Reset Your Child’s Brain: A Four-Week Plan to End Meltdowns, Raise Grades, and Boost Social Skills by Reversing the Effects of Electronic Screen-Time. To learn if your child may be experiencing game-induced seizures, ask about any weird sensations occurring while playing video games. See if you can get the child to wear cobalt blue dark glasses while gaming; in these are extremely effective at protecting against or reducing the severity of seizures. Photosensitive seizures can occur when people with photosensitive epilepsy are exposed to intense visual stimuli: bright, rapid flashing light and bold patterns with strong contrasts. An unknown segment of the population has photosensitive epilepsy, including people with no history of seizures. It is under-reported and under-diagnosed. In those who develop the condition, photosensitive epilepsy typically is hidden until the first noticeable seizure occurs in the presence of bright flashing or patterns. Most people with other types of epilepsy are not photosensitive. In other types of epilepsy, seizures are much more unpredictable. Seizures can be of any type, from tonic-clonic episodes with loss of consciousness to brief absence seizures that can be as subtle as a brief hesitation or stare. Most people do not have photosensitive epilepsy, but many who do are unaware that they have the condition until a they experience a seizure during or after exposure to flashing or patterned images. Some individuals may have seizures that are too subtle to notice. Screen grab from a sequence in The Legend of Zelda that could provoke a seizure in individuals with photosensitive epilepsy. 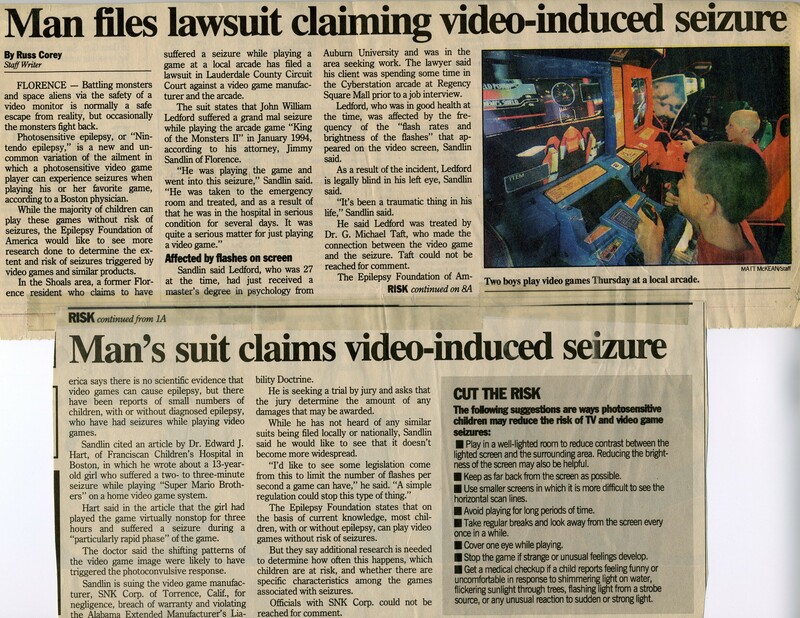 Guidelines for seizure reduction originated in 1994, when the UK adopted technical guidelines to accommodate TV viewers with photosensitive epilepsy. These guidelines, based on studies by photosensitive epilepsy experts, outline the characteristics of flash rates and spatial patterns that typically trigger seizures in people with photosensitive epilepsy. They were later updated and some have been adopted by the World Wide Web Consortium (WC3), the international group that produces website standards for all types of applications, and the International Telecommunication Union. Visuals adhering to these guidelines are unlikely to provoke seizures in 97% of people with photosensitive epilepsy. Although most games carry seizure warnings, not all games contain the types of images that can bring on seizures. The warnings are not specific to the content of a given game, so consumers who pay attention to the warning don’t know whether it pertains to the game they are about to use. So I test them. I tested the games using downloaded clips of gameplay that I loaded into an application called the Harding Flash and Pattern Analyzer. The FPA is widely used by TV producers and networks in the UK—including by the BBC—to reduce the risk of seizures from material on broadcast TV, and is used by some game studios. It examines video sequences frame by frame for very specific and measurable image qualities that research shows can trigger seizures. For more specifics on how to interpret the test results, please see this prior post. For more on my testing process, see this one. 2 of these 4 Xbox games don't cause seizures!